When I set out on the streets of Manhattan with a camera in 2011, I had no idea I would eventually publish a book of street photography. I was simply taking photographs. Then, gradually, I started making photographs, as opposed to "taking" them. More time passed and my signature style started to emerge. 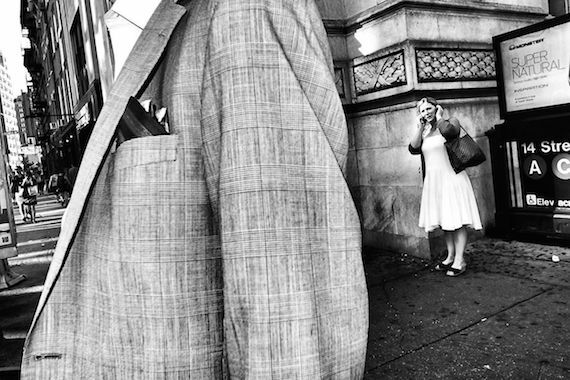 By early 2012, I was in full swing, making street photographs that were somewhat unique in their approach. 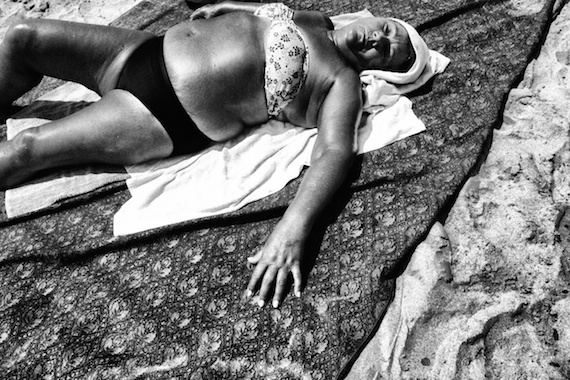 This whole body of work was produced with a Ricoh GR Digital IV camera. It's a fantastic little camera with lightening fast capabilities - a feature that would become crucial to this work. 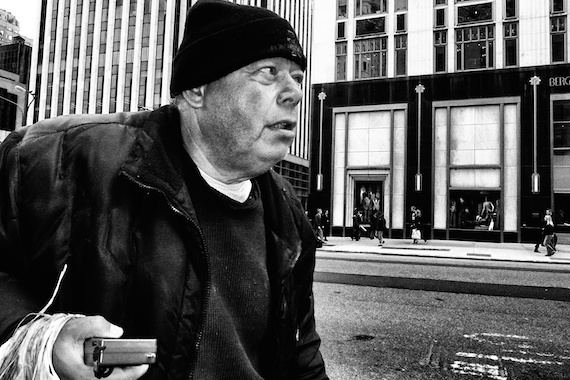 The Ricoh is very discreet, which is great when it comes to shooting on the streets. The LCD screen turns off (you can frame with an optical viewfinder), there is no shutter noise, the auto focus system is a hybrid that allows focus with a full-press of the shutter - equaling zero shutter lag. For those of you who are not into photography, this little digital camera allows you to be a ninja and capture the fastest moving subjects with ease. I couldn't have produced this body of work with any other camera - period. Employing the "no-finder" method of shooting that Daido Moriyama made famous, I initially produced a few "fragment" photographs by accident. I would merely frame off a head or an arm by not aiming the camera well. Although the Ricoh GR has a fixed wide-angle lens (28mm) it's still no guarantee when you're shooting without looking through a viewfinder. Regardless, some of these fragment shots turned out well - they were interesting and different. I liked what I was seeing so I began to produce this style more deliberately. Eventually I would take up the viewfinder more to purposely frame out people's heads and arms and legs. I was chasing the human fragment, except that particular term, "human fragment", was yet to be coined. The term "human fragment" emerged out of an email discussion I was having with New York photographer Joel Meyerowitz. We were discussing my new work and Joel was insisting that the work was too ugly, too vulgar, for his taste at least. During this heated discussion about whether my work was of any value (in his eyes) he began to speak about my photographs as "human fragments". Although I was rather annoyed that he didn't see the beauty in my work, I am forever grateful to Joel for coining that term for me. It would not only be the go-to in terms of describing my unique style, it would also, eventually, become my book title. I have an edgy personality. I'm a nervous person. I'm not the kind of photographer that would naturally produce contemplative nature scenes or very thought out portraits and so on. That's not me. This work is very much me. The off-kilter framing, rushed timing, gritty high-contrast scenes are a good representation of me as a persona and as a photographer. 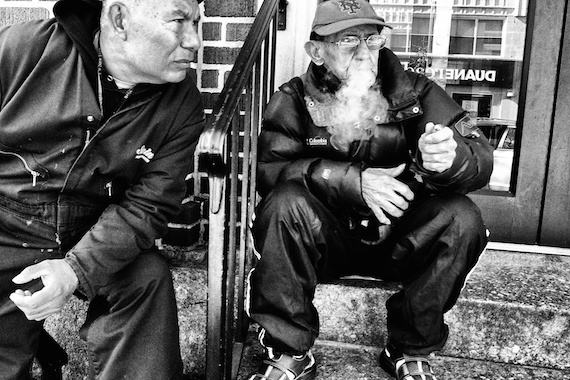 But these photographs also represent New York City well too. New York is an edgy and nervous place also. There is no sense of calm on the streets of Manhattan, believe me. Over time I settled into a photographic routine. I become both confident and comfortable with my camera, my style, and my subject matter. I felt that I was not only making photographs that were interesting and personal, but photos that were unique and different also. 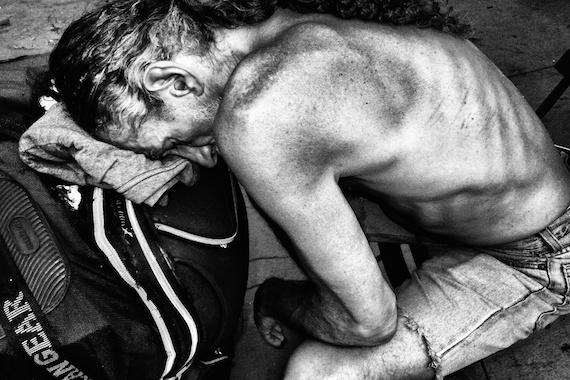 I would photograph in the day and pour over thousands of street images at night. 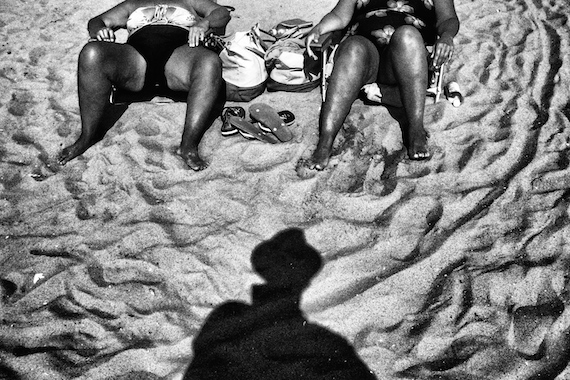 I looked at the famous people, obviously - Robert Frank, William Klein, Daido Moriyama, Bruce Gilden - and I looked at my contemporaries also. I especially looked at my contemporaries. I wanted to know what others were making at that exact moment, because I didn't want to make similar photographs. I wanted to be different. 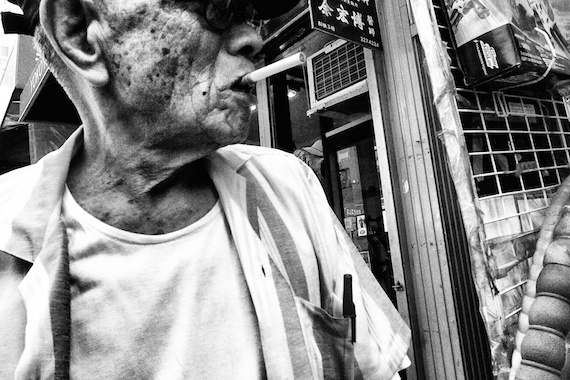 I wanted to break free from the sameness that was running rampant in street photography. In the end, I think I was reasonably successful. I think I did break free from the mold. Am I the first person to produce fragmented photographs? No. But together with the location and the grit and grain and the small sensor feel and so on, I think it combines to make rather unique photography. When I had an entire body of this work I went Brooklyn Arts Press in New York and proposed a book. The rest is history. Sure, some people don't like my work. I understand that sentiment. There is a lot of work out there that I don't like also. My goal was not to produce a book that would be loved by all, it was to produce a book that would add something new to the conversation, something different to the mix. 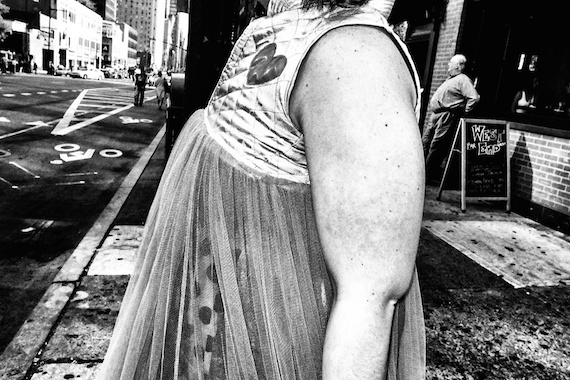 When William Klein produced his early work of New York, no one would even publish it. Editors called it crap. Perhaps time will be the final ingredient needed for my work to truly appreciate. 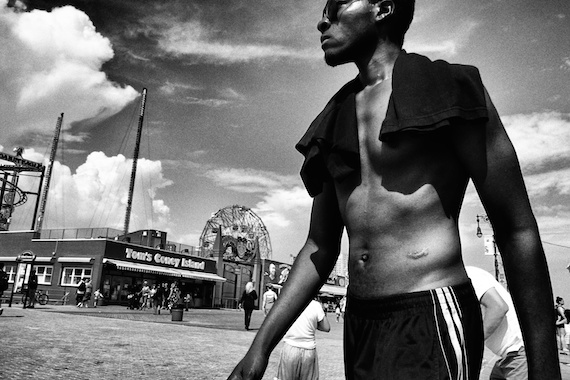 The Human Fragment is a book of monochrome street photography covering a variety of subjects in and around Manhattan as well as Coney Island. The first 50 editions of the book are hand-signed. The collection contains 64 photographs as well as a foreword by New York art critic and writer Michael Musto. 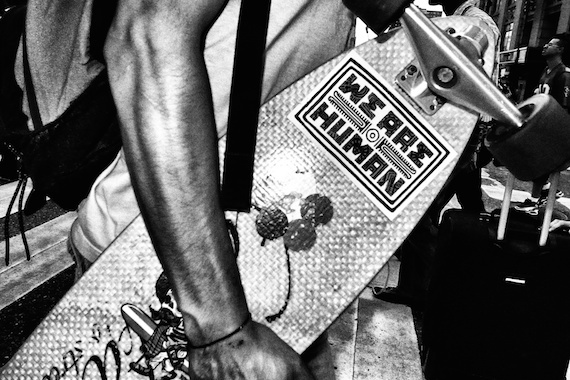 If you're looking for street photography that's a little different, The Human Fragment might just fit the bill. The book can be ordered directly from Brooklyn Arts Press or online at Amazon.com.